The Islands of San Francisco Bay is James Martin's vision. 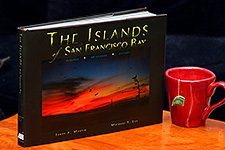 A Bay Area native, the idea to produce a book that would cover ALL the islands in this great Bay came to him in the early 90's while as a photojournalist he was shooting island images for various nature and ecological publications. More than just a pretty coffee-table companion, he envisioned a voluminous reference book that would draw the reader in with imagery and keep them there with rich stories. A long-awaited dream, he began actively shooting images for the book in the year 2000. Thousands of slides, several talented writers, and a few years later the book was complete ...sort of. It needed to be assembled. Also a Bay Area native, I had the task of assembling the book with graphics software. For both of us, the desire to produce something uniquely valuable became stronger each month during design and production. "It's our book!! ", we'd say while we debated about whether to put it together a certain way. Ultimately, the statement (declaration, really) was the abandonment of convention in favor of something novel. We wanted our book to stand out. For more on this informal story, click Down Window?